When Terry Pratchett first started writing the Discworld books in 1983, few could have expected it to grow into a world so detailed that it rivals Lord of the Rings, Oz, and Barsoom in scope. This series spans 39 novels, numerous stories, a half dozen movie adaptations, and as of yesterday, one iPad app. 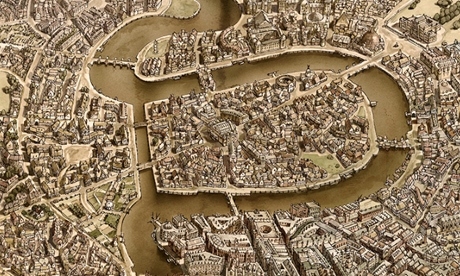 The Ankh-Morpork Map For iPad allows the reader to explore this most infamous city. Ankh-Morpork is known as the largest city on Discworld, a world that rests on 4 elephants riding on the back of a turtle, flying through space. This city is an unspoken character in many of the novels, and now it's been brought to life. The app is based in part on the previously published The Compleat Ankh-Morpork, but it builds on that older book by adding more details drawn from the rest of the Discworld novels. You will find detailed info on the characters living in the city as well as info on the businesses, services, and landmarks mentioned in the Discworld stories. And like any map, this app includes a business directory and street index as well as two beautifully detailed, hand-drawn maps of the city. You can even enjoy walking tours of the city and unlock achievements as you read. If Inkling’s Products Are so Great Then Why Does the CEO Come Across Like a Snake Oil Salesman? Even at $14, which is sticker shock for an app, I know a few people that’d buy this if it were on Android. Heck, I’d probably buy it merely as an incentive to go read more of the excellent books. It’s not all that expensive when you compare the price to what the average Discwrold fan spends on books. The Compleat Ankh-Morpork actually costs more, and I’m seriously considering getting both.